11 years ago (2007) I came to Qatar for a 3 day business trip. This is my photos from that visit. Unfortunately during this visit I had very little time to look around Qatar. Our driver just made a couple of stops for us to jump out and grab some shots. And my camera was very basic with quite a low resolution. Also I didn’t really know what I was shooting. Obviously in hind site I would have loved to have taken many more photos of things that would be really interesting to look back on now. One of the shots is of Katara before the ground was raised in front of it. There is a couple of Zig Zag (Lagoona) Towers while they were still under construction, and of course a number of shots taken in the city. We also had a brief excursion to Barzan Towers so there are a number of images of the towers and also a couple taken from the top of Barzan Towers showing the area surrounding them. Which these days has been fully developed. We were staying in the Ritz Carlton Hotel, and I snapped some shots of the reclamation of land which is now Lusail from my hotel window. An interesting project would be for me to return to these exact locations and take the same shots again for comparison. Perhaps one day I will get around to it. Last Thursday I was invited to take some photos at the award winning Italian restaurant ‘Antica Pesa’ located in the grounds of the Marsa Malaz Kempinski hotel, on the Pearl Qatar. Having been here in Qatar for almost eight years now, there is one tourist destination that has been on my to do list all of that time. A destination that requires a vehicle capable of off roading, and that is something I have never possessed here. My son on the other hand has got a suitable vehicle and although I have avoided going into the dessert with him so far (because he is a nutter when driving off road), Victoria and I decided we would join him for this jolly to finally go and see Film City. Film City is located on the West Coast of Qatar in the middle of the dessert, and was used for filming a soap called ‘Ayal Al Theeb’ (Sons of The Wolf) a Qatari soap that was first broadcast in the year 2000. Although no longer used for filming, the location remains, and appears to have people living there and maintaining it. 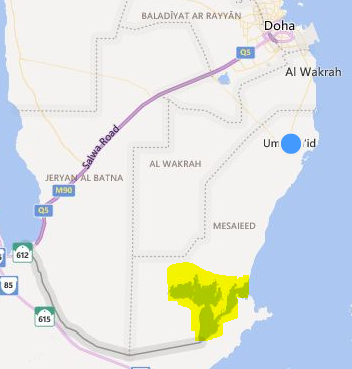 So last Friday the three of us set out from Doha in the direction of Dukhan. We were being guided by Google Maps, and it turns out that is a big mistake. Apparently there is a much better route which involves going to Zekreet and then on from there. But that is something we have learned since making the trip. Anyway once we got there we found a very well maintained small compound. If I had not been told it was a film set, I would never have guessed. Personally I found nothing of interest there, and just snapped off some shots on my phone to prove I had finally done it. We weren’t keen to hang around because the wind was blowing like mad, and it was blooming freezing. For me this was worse because I was dressed like it was still summer, something I really regretted. Bri and Vic had dressed a little more appropriately, but even they were cold. There is a little shop there where you can buy drinks and snacks, but we were keen to get away as soon as possible. Once back in the car we decided to take in another point of interest located nearby. We actually drove past EAST-WEST / WEST-EAST BY RICHARD SERRA on the way to Film City, but decided to go and see it on our way back. This piece of dessert art was of much greater interest to me, and made the trip worthwhile in my opinion. All in all, a nice ride out. We left Doha around 12 noon, and were back around 6pm including a stop in the Mall of Qatar to get supplies on the way there, and a much needed coffee beak on the way back in Mc Donalds Dukhan. Would I do it again? Nope! Once done, it’s done. Well to be honest it was actually a photo walk around Abdul Aziz Bin Ahmed Street. But Musheireb was the reason I took the walk. It was the contrast between Musheireb Street and Abdul Aziz Bin Ahmed Street that made me get out of the car and start snapping with my trusty old Sony RX100 Mk I. The old and the new, the coming down and the going up. Images that right now are not that interesting I believe will be in years to come. So after over 6 years here in Qatar, I have finally made it to the Inland Sea. Not having an all terrain vehicle has meant I could never make the trip myself, and I never got around to going on one of the paid tours of the are a. A friend in church (Kevin) goes there every weekend after the service. He has been inviting me for quite some time to join him, but to date I haven’t taken him up on the offer. However last Friday I decided I would go along for the ride. I figured it would be a good opportunity to release some of the stress I am under at the moment. Two other members of the church, a lovely couple called Edna and Bob also decided to come along for the trip. And as soon as we had finished some light snacks in the church canteen we headed out. To our complete surprise, and in complete contrast to when we entered the church, when we exited we were met with a thunderstorm. Now that was a surprise indeed. We asked Kevin if the trip was still on, and he said indeed it was, but because of the lightning we would have to be careful where we park when we got to the Inland Sea. It was quite a road trip down to the edge of the desert. The wind was blowing a gale, there was a sandstorm and occasionally very heavy rain. There was loud thunder and lightning kicking off all over the place. Once at Mesaieed we pulled into a Woqod petrol station for Kevin to let air out of his tires and for all of us to take a bathroom break and grab a coffee. Only there was no coffee as the coffee machine was broken doh! It also gave my travelling companions the opportunity to pop into the bathrooms and change out of their church clothes. Something I didn’t have to do because I am one of those people that doesn’t dress up for church, and I was already in my shorts. We drove a lot of the way on the salt flats, that were quicker but not very exciting. However I managed to snap a few images of some nice sand dunes along the way. Then we arrived at what Kevin described as the Inland Sea Inlet. Kevin also mentioned that it has been known for unscrupulous tour operators to tell their clients that this is the Inland Sea and that’s as far as they go. When in fact it’s just where the Inland Sea begins. With the sun starting to go down, this was very pleasant. And we could see 4×4’s driving around the dunes in the distance next to the inlet. The bad weather on the way down was now nowhere to be seen. Then off we went again heading further south towards the Inland Sea. Along the way we came across a ‘Dune Bashing’ casualty. Dune Bashing is one of the favourite weekend pastimes here in Qatar, and many 4×4 owners head into the desert to bash the desert. Climbing, rounding and descending dunes for thrills. But sometimes they get it wrong and end up wrecking their car. We came across these guys shortly after getting a decent wrong. Kevin explained that this particular dune is actually named ‘The Stopper’. Sometimes weather changes the base of the dune into a shape that if you come down too fast will quite literally stop you in your tracks. And that is exactly what had just happened to these poor chaps. We drove up to them and enquired if they were ok, and if they needed any help. They did not, and in fact were calling in for assistance from their friends at that very moment. Then we were a little bit un-feeling by taking photographs of their miserable situation. Which I’m sure must of been a little irritating for them. They had blown out both of their front tiers and sustained some front end damage, but fortunately no one was hurt. However in the past this very dune ‘The Stopper’ had cost lives when people got it wrong. And we could see car parts strewn around from previous mishaps. Then off we went again. Along the way, there was numerous vehicles passing in either direction. We could see in the distance the inlet to the Inland Sea once more. The sun was starting do sink quite quickly now. We paused near the inlet to take in the view, and I grabbed a group shot with Saudi just visible in the background. Then we dropped back down to the salt flats to continue down to the Inland Sea. There was a brief stop on the flats while I snapped a couple more shots of the inlet. I discovered it’s not that safe to leave the vehicle to take snaps of bushes growing out of the side of sand dunes when a cavalcade of 4×4’s came charging around the corner while taking this one. On this occasion we were in no danger as they spotted us early. But it brought home to me the fact that without warning a dune bashing 4×4 could suddenly appear over or arround a dune and flatten me. Then off we went for the final drive to the Inland Sea. Speeding along through the desert with the sun reflecting off the Inland Sea in the distance. My camera hanging out of the window shooting the spectacular scene. And finally we arrive. Just as the sun is about to disappear. Wow what a sight! Absolutely beautiful. Cars parked around the coast, people swimming, picnicking and just unwinding in the wonderful place. We headed to the top of a dune and setup base camp there. Then settled back to watch the watch the sun finally say good night with some nice snacks and drinks. Once the sun was gone, the noise of engines in the distance began to reduce and finally for the most part stop. The stars came out, and we just sat and told stories and enjoyed each others excellent company in almost complete darkness and silence. What a fabulous excursion. Thank you Kevin for driving us, and thank you Bob and Edna for being such fabulous companions on this wonderful trip. Yesterday I was once again on site at the new Souq Waqif in Wakra. As I parked I decided once again to pull out my little Sony RX-100 from my bag and go and take some snaps. It wasn’t a planed photo shoot, I just decided on the spur of the moment to grab some more images of the project approaching completion. So there I am clicking away, looking for angles and shots depicting the work approaching completion, and I notice a fellow photographer doing the same thing. At first I was a little annoyed that I didn’t have my massive Sony a77 DSLR with me, complete with battery hand grip making it look even larger and a nice big fast lens to go with it. I stupidly felt inadequate with my little RX-100, and suddenly felt the need to look like a photographer. How stupid was that?! This poor guy just wanted to take some nice shots of the Souq, and I wanted a camera showdown with him. Anyway, it wasn’t going to happen. My large professional looking camera was back at home, and so me and my little RX-100 got on with the job. After a while of not paying any attention to guy with nice big professional looking DSLR, he caught my attention again. I stood and watched as he framed his shots, and imagined what the images were he was capturing. My ego settled back down. This guy had the big camera, he had the nice camera bag and accessories, but the shots he was framing were very, errrr…. shall we say ‘money to buy big camera, but doesn’t know how to use it’ type shots. This is when I realised that just having the biggest camera on the planet, a photographer it doesn’t make. My lovely little RX-100 goes everywhere with me. It’s always at hand. And if I had to choose which camera out of the two (RX-100 or a77) I would pick my RX-100 every time. In fact I am considering selling my a77 as it is getting so little use these days. My next camera is going to be a high quality CSC (Compact System Camera) and probably a Sony. The only reason I produce my a77 now is when I need to look like a photographer. But I find myself more artistic, and ever ready with a small discrete camera. And when you have a small camera no one even notices you. You can take them anywhere and no one gives a damn. Take a big DSLR for a walk and everyone is on guard, they are nervous of the camera and what you are doing with it. Once I got home I was very eager to take a look at my images and of course upload to Flickr. That RX-100 of mine never disappoints. I am so please with the images I captured on it’s large (for a compact camera) 1″ sensor. And I will bet my shots look better that Mr. I Have a Big Camera’s shots. Where did these giant model sea creatures come from? And why are they scrap now? Not something you see every day. I spotted these massive model sea creatures while driving between Lusail and Shamal Road. By looking at the scrap in front of them you can get an idea of how big these things are. I am using a telephoto lens and they are quite some distance from where I managed to stop my car. Where did they come from? And how did they get washed up here? Anyway I was glad I spotted them because they gave me today’s OPPD (One Photo Per Day) project’s image. Job done, hope tomorrow I stumble across something else interesting. It saves me having to think to hard what to photograph that day. Whereas most airports will go nuts if they catch you taking photographs, the new Hamad International Airport #HIAqatar positively encourage it. It was great to see so many things of interest to photograph, and so many people photographing them. And if I had longer, there would be loads more images. Well done Qatar! This airport is truly magnificent! Yesterday I was near to the control tower, and had my trusty Sony RX100 Mk1 on my belt, so I was able to snap a couple of nice close up shots of this splendid building that is normally only seen from a great distance. Well according to East 51, or is it 51 East (never can get that one right) it will be here at the end of June. Yes this is my dream camera with everything I’v ever wanted built in, almost as if Sony have read my mind. I have owned the Mk 1 for over a year now. Resisted buying the Mk 2 when it came out shortly after I bought the Mk 1 because although the Mk 2 is much improved, I just couldn’t bring myself to splash that much cash again within month of buying its predecessor. I love my RX100 and I rave about it at any opportunity I get. It literally fits in your pocket (or on a belt in my case) and goes everywhere with you. It totally removes that horrible situation where you have a great photo opportunity and no blooming camera with you. And NO! All of those who are about to argue they always have a camera with them on their phone, sit back down and keep quiet, because whilst phone cameras can grab an image, it can never (I’m sure one day I will regret saying never) reproduce the image quality of a 1″ sensor with the quality optics that the RX100 has. I have never sold an image taken on a phone, I have sold images taken on my RX100 and RX100 images taken by me are used in printed and online media on a regular basis. I still use my big clunky DSLR when on a planned photo shoot, but I can’t take that with me everywhere I go. Well I did at one stage in my life, and I hatted lugging that heavy backpack around with me all day. I am on 51 East’s alert list and they are going to notify me when these come into stock. I will be down there right away with my hard earned bucks to pick one of these bad boy’s up. And then I am going to write about how good it is and bore you all some more. The above images are links from from Trust Reviews who have a very comprehensive review and video of the Mk3 which you may like to take a look at. iCandy on Yay! I’m an Honorary Cultural Ambassador! zareenn3 on Yay! I’m an Honorary Cultural Ambassador! © 2018 Brian Candy :: iCandy.